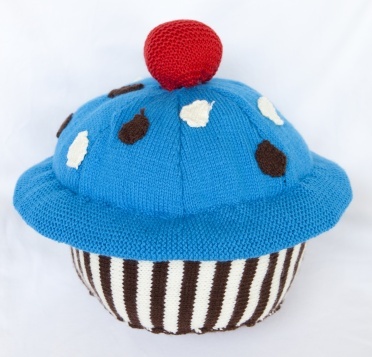 This is one for the cupcake lover - easy instructions to make a Giant Knitted Cupcake. Follow this easy knitted cupcake pattern and in no time you will have your own giant cupcake. 8 ply wool in three colors (two colors for base and one for frosting) and scraps of red if you wish to add a cherry on top! Cast on 15 stitches in main base color. Work in stocking st (beg with a knit row), casting on 4 sts at beg of next 2 rows = 23 sts. Next row: Cast on 2 sts, knit to last st, inc in last st = 26 sts. Next row: Cast on 2 sts, purl to last st, inc in last st = 29 sts. Next row: Inc in first st, knit to last st, inc in last st = 31 sts. Next row: Inc in first st, purl to last st, inc in last st = 33 sts. Rep last 2 rows once = 37 sts. Next row: Inc in first st, knit to last st, inc in last st = 39 sts. Rep last 2 rows once = 41 sts. Next row: Inc in first st, knit to last st, inc in last st = 43 sts. Work 3 rows stocking st, beg with a purl row. Next row: Inc in first st, knit to last st, inc in last st = 45 sts. Cont in stocking st (beg with a purl row) until circle measures 13.5cm (5 1/2 ins) from beg, ending with a purl row. Next row: K2tog, knit to last 2 sts, k2tog = 43 sts. Next row: K2tog, knit to last 2 sts, k2tog = 41 sts. Next row: K2tog, knit to last 2 sts, k2tog = 39 sts. Next row: K2tog, knit to last 2 sts, k2tog = 37 sts. Dec one st at each end of every row until 27 sts rem. Next row: Cast/bind off 2 sts, purl to last 2 sts, P2tog = 24 sts. Next row: Cast/bind off 2 sts, knit to last 2 sts, K2tog = 21 sts. Next row: Cast/bind off 4 sts, purl to end = 17 sts. Next row: Cast/bind off 4 sts, knit to end = 13 sts. Cast on 30 sts in main base color. Work in stocking st stripes of 4 rows each of both base colors until stem measures 70cm (28 ins) from beg, ending with a complete stripe and on a purl row. Using color from previous row, cast/bind off loosely. Cast on 25 sts in frosting color. 1st and 2nd rows: **K20, turn knit to end. 3rd row: Knit to end. 4th row: Knit to end. Rep from ** to ** until short edge measures 70 cm (28 ins) from cast on, ending with a 4th row. Cast on 30 sts in frosting color. Work in stocking st until section measures 6.5cm ( 2 1/2 ins) from beg, ending with a purl row. Dec one st at each end of next row, then in every foll 6th ow until 26 sts rem, then in every 4th row until 18 sts rem, then every foll alt row until 10 sts rem, then in every row until 2 sts rem. Make 7 Cupcake Upper Sections. Cast on 30 stitches. Knit 35 rows stocking stitch. Sew running stitch around outside edges and gather tightly and fill with polyester filling. Inc in first st, knit to last st, inc in last st = 7 sts. Rep 1st and 2nd rows once, then 1st row once = 11 sts. Work in stocking st (beg with a purl row) until spot measures 3 cm (1 in) from beg, ending with a purl row. Next row:K2tog, knit to last 2 sts, K2tog = 9 sts. Next row:K2tog, knit to last 2 sts, K2tog = 7 sts. Next row:K2tog, knit to last 2 sts, K2tog = 5 sts. Make 12 sprinkles in base colors. Using yarn needle, darn in ends. Sew cast on and cast off edges of stem together. Sew base to one side edge of stem. Sew side edges of upper sections together and leaving cast on edges unstitched. Sew cast on edge of underside to cast off edge. Sew long side edge of underside to cast on edges of upper section, matching seam of underside to a seam on upper section. Turn to RS and fill firmly. Sew edges of underside toegether with large lacing stitches, pulling the underside so its sits with approx 2.5cm (1 in) on the top of the cupcake and the rest on the bottom (stem side) of the cupcake. Sew short edge of underside to stem of giant knitted cupcake using ladder stitch. Oversew sprinkles on top of cupcakes as desired. Stitch cherry on top of giant knitted cupcake.